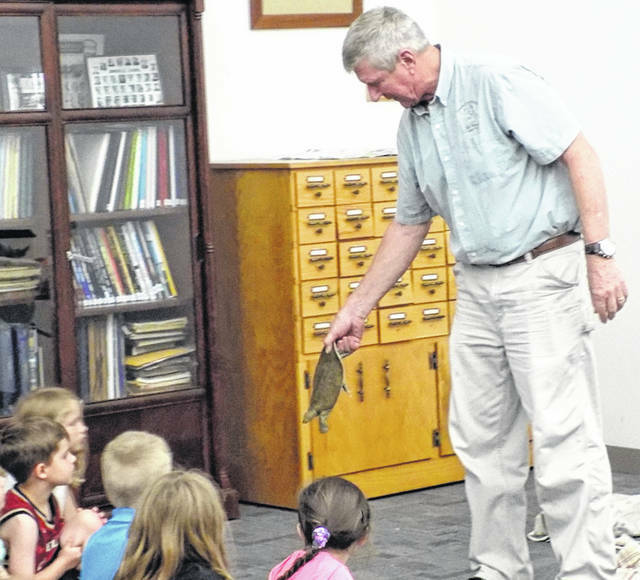 JOHNSVILLE — Perry Cook Memorial Library hosted Bill Fisher from the Crawford Parks District for its weekly Summer Reading Club program. His program, “Rock Around the Clock”, is an interactive and informative talk on the various rocks and minerals found around Ohio. He showed examples of minerals, including pyrite and rose quartz. The sedimentary rocks displayed included shale and coal, and there was flint, which is the official gemstone of Ohio. He also brought a variety of reptiles and amphibians native to the state, as well as non-native species like a tarantula and a bearded dragon. The turtles, of the painted, box, and soft-shell varieties, were popular with the kids. Surprisingly, the snakes were well-received with many children wanting to hold and interact with them. This is an engaging, family-friendly program that introduces kids of all ages to some of Ohio’s natural resources.